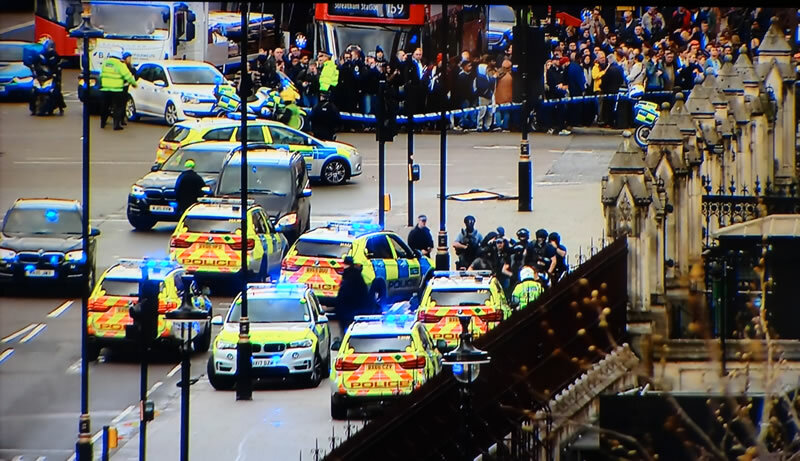 Nevertheless the mainstream media is seeking to pick over every detail of the attacker Khalid Masood (Adrian Russell Ajao) who used his car to kill 4 and injure more than a dozen others in his act of lunacy. 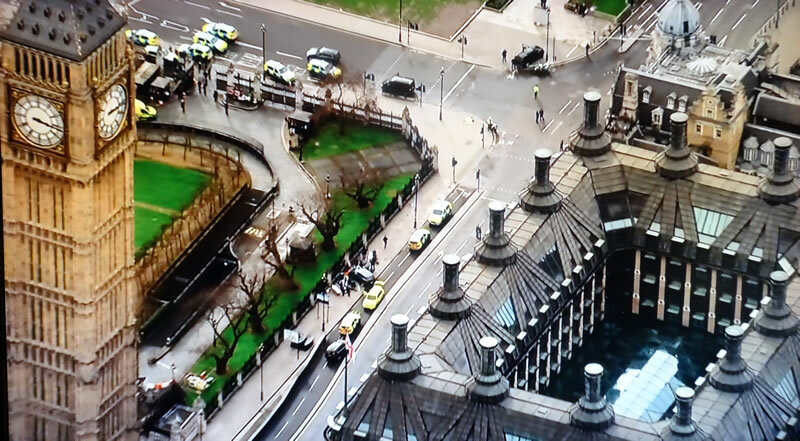 The media trying to connect the dots that do not exist, with the recipients of government funding aimed at PREVENTING such events given ample air time to propagate their paid for propaganda messages with their primary objective for the tax payer funding of their organisations to continue, organisations populated with ex-jihadi's, thus effectively being paid by the government to NOT blow themselves up. 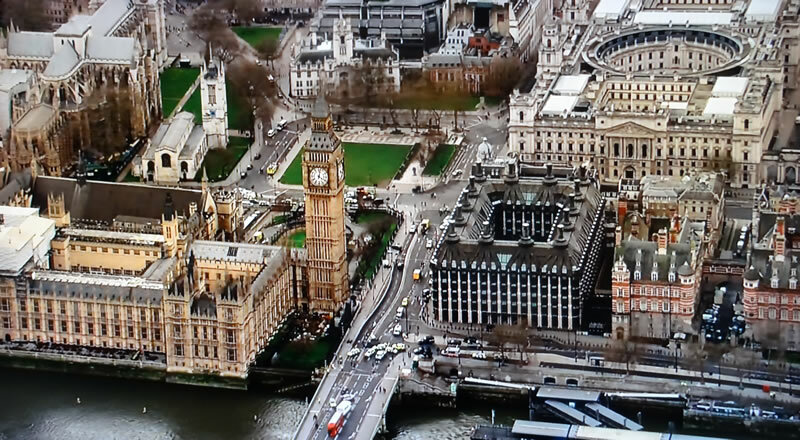 However, all of this focus and coverage of the events in London on the 22nd of March are a red herring. For it is not actions by lone wolfs or even groups of radicals that slip through the state security apparatus's surveillance net that Britain as a nation needs to worry about or focus upon, for the real threat to Britain has I have often covered over the years is the collision taking place between the 'Age of Reason' and the 'Age of Religion'. For it is not the violent actions of individuals or small groups that effects the future prospects of a whole nation such as Britain. Instead it is the insidious nature of primitive cultures soaked in ancient ideologies in ignorance of that which has come to pass subsequent to when their scriptures were written and especially the advancement in knowledge and understanding over the past 400 years. Primitive cultures and ideologies that seek to dilute the efficacy of progressive cultures such as that of Britain, as for decades the policy of governments of all parties has been to promote multiculturalism one of all cultures being equal when the reality is the exact opposite. Thus resulting in progressive cultures instead of being reinforced and promoted are instead been diluted and diminished by for want of a better word ignorant ideologies that pursue a fictional fantasy in pursuit of an eternal afterlife. And Harry Dent this month (March 2017) arrived at very similar conclusions that it was not Trump nor Brexit that the West needs to worry about but the persistence and spread of ignorance. It’s now clear to me that globalization has peaked for years, if not decades, to come and we’re going to have to regroup around regions and countries with common cultural and religious values before we can globalize again in a new, more bottoms-up network economy. The best global graph of the major different cultures comes from The Global Values Survey out of a recent article by Will Wilkinson. 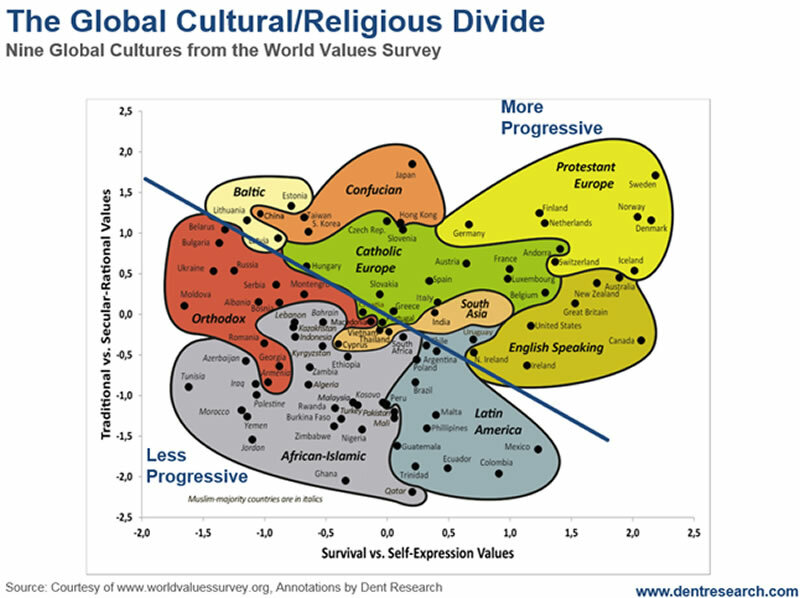 This shows nine distinct global cultures around two variables that I find very meaningful. On the x axis is survival (conformist) versus self-expression (individualistic) values. On the y axis is traditional (faith) versus secular-rational (scientific) values. 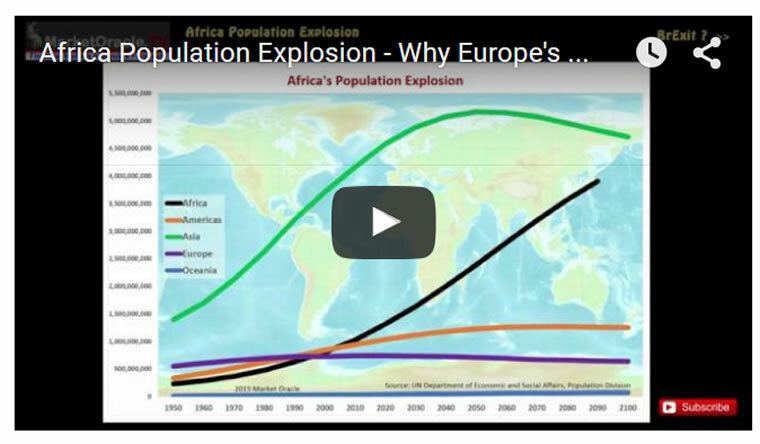 You can see here why there is such a clash between the more affluent Christian cultures of Europe and the English-Speaking groups versus the African-Islamic ones. They’re quite literally on the extreme opposite sides on both value dimensions. The bottom line is that societies can only prosper, develop and hold a competitive advantage through fostering and becoming more progressive rather than remaining or becoming more regressive which is the domain of religious ideologies that pander to a utopias of several thousands of years ago that never existed! After all this is why so many from regressive nations seek to migrate to progressive nations such as Britain that they see as an Elysium, a paradise on earth compared to their own nations stuck in downwards spirals of over population, corruption and in the grip of unbending religious ideologies that seek to dictate thought and actions of the masses. Unfortunately what many immigrants from the Regressive nations fail to realise is that they are also bringing along with them that which they sought to escape i.e. authoritarian ideologies that dictate what can and cannot be done, lack of freedom of thought and expression which is inbuilt in all religious ideologies and so slowly over time replicate communities that exhibit the same characteristics as that which they sought to escape from. The only solution is as I have often stated is for the reinforcement of progressive ideas through secular education in an attempt to over time diminish religious ideologies that should only reside in the home or places of worship and that the state and wider communities should NOT give any deference or ground towards regressive ideologies i.e. through the public celebration of religious festivals. The good news here is that children are hard wired to want to fit in, to want to be like all od the the other children which gives secular states through progressive programs to foster all schools to be MIXED, that are not populated with or concentrate toward a particular regressive religious ideology. Unfortunately socialism and the policy of multiculturalism has resulted in thousands of schools throughout the UK such as the city of Birmingham are highly segregated, which instead of fostering progressive integration foster differences and pander to religious fantasies as being based on fact. So the schools are the starting point to undue the damage done during the past 30 years of multiculturalism schools must be forced to become MIXED for children will always seek to fit in with their peers, so if their life experience is of living and being educated in a segregated environment then that is how they will be as adults, conditioned towards segregation, seeing those from outside of their community as the other. So whilst it might take a generation but the multiculturalism damage of the past 30 or so years can be undone! And where progressive ideas are concerned here is the latest from the Hubble space telescope that paints a picture that is far beyond the comprehension of those who wrote the holy books and scriptures thousands of years ago that many people still take as being the literal truth, which in reality tend to at complete polar opposites to the nature of reality as we understand it to be today. An international team of astronomers using the NASA/ESA Hubble Space Telescope have uncovered a super massive black hole that has been propelled out of the centre of the distant galaxy 3C186. 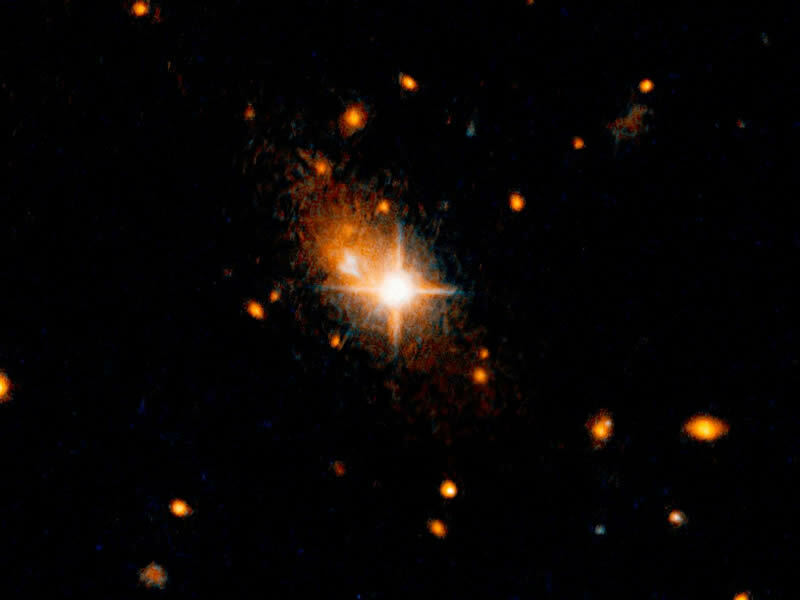 The black hole was most likely ejected by the power of gravitational waves. This is the first time that astronomers found a super massive black hole at such a large distance from its host galaxy centre.